Designed for human exploration missions into deep space, NASA’s Space Launch System (SLS) represents a new spaceflight infrastructure asset, enabling a wide variety of unique utilization opportunities. Together with the Orion crew vehicle and ground operations at NASA’s Kennedy Space Center in Florida, SLS is a foundational capability for NASA’s Journey to Mars. From the beginning of the SLS flight program, utilization of the vehicle will also include launching secondary payloads, including CubeSats, to deep-space destinations. Currently, SLS is making rapid progress toward readiness for its first launch in 2018, using the initial configuration of the vehicle, which is capable of delivering 70 metric tons (t) to Low Earth Orbit (LEO). On its first flight, Exploration Mission-1, SLS will launch an uncrewed test flight of the Orion spacecraft into distant retrograde orbit around the moon. Accompanying Orion on SLS will be 13 CubeSats, which will deploy in cislunar space. These CubeSats will include not only NASA research, but also spacecraft from industry and international partners and potentially academia. Following its first flight and potentially as early as its second, which will launch a crewed Orion spacecraft into cislunar space, SLS will evolve into a more powerful configuration with a larger upper stage. This configuration will initially be able to deliver 105 t to LEO and will continue to be upgraded to a performance of greater than 130 t to LEO. While the addition of the more powerful upper stage will mean a change to the secondary payload accommodations from Block 1, the SLS Program is already evaluating options for future secondary payload opportunities. Early discussions are also already underway for the use of SLS to launch spacecraft on interplanetary trajectories, which could open additional opportunities for CubeSats. This presentation will include an overview of the SLS vehicle and its capabilities, including the current status of progress toward first launch. 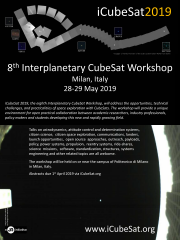 It will also explain the opportunities the vehicle offers for CubeSats and secondary payloads, including an overview of the CubeSat manifest for Exploration Mission-1 in 2018.